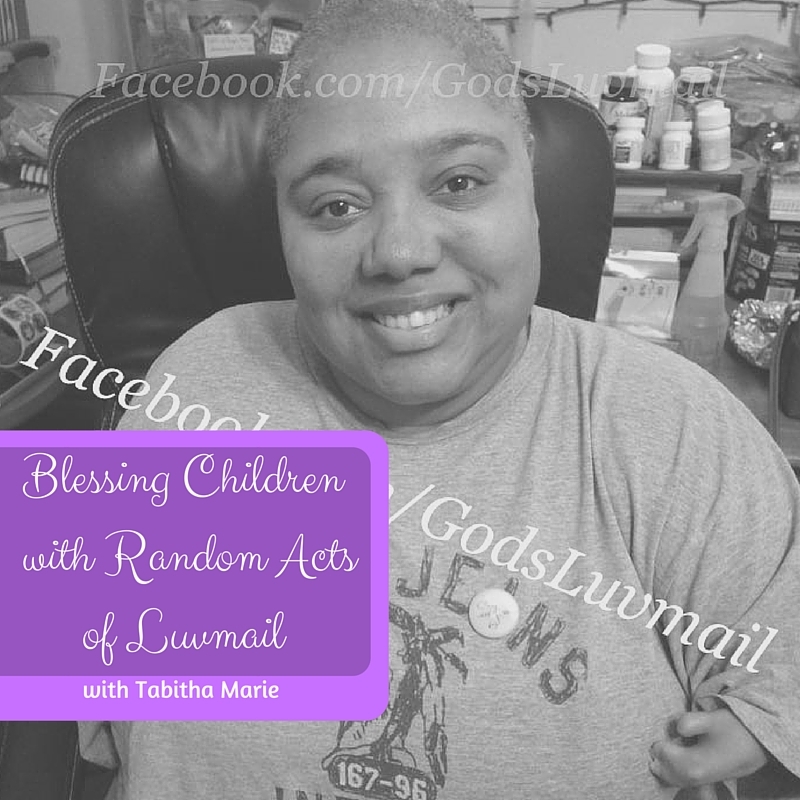 Tabitha Marie is the amazing and loving founder of “Random Acts of Luvmail,” a family run organization that provides mail and goodie bags to children who are in the hospital or need to be uplifted for any reason. 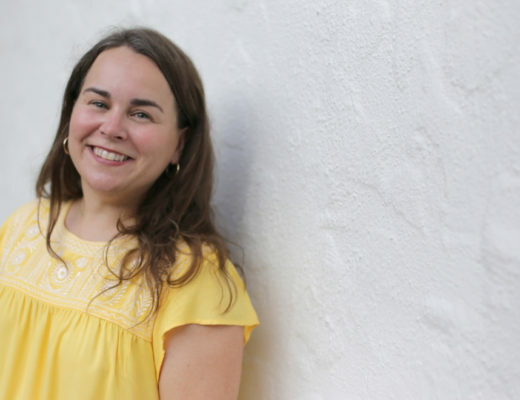 Tabitha started the organization in 2007 and it has moved from New Orleans to San Antonio, Texas, where she and her sister and daughter work together to create, package, and send Luvmail to three hospitals and across the country via mail. I really loved speaking with Tabitha – her inspiring story and loving way of spreading encouragement and positivity are so welcoming. I know that you will feel rejuvenated just from hearing her explain her outlook and passion for Luvmail and the children she serves. 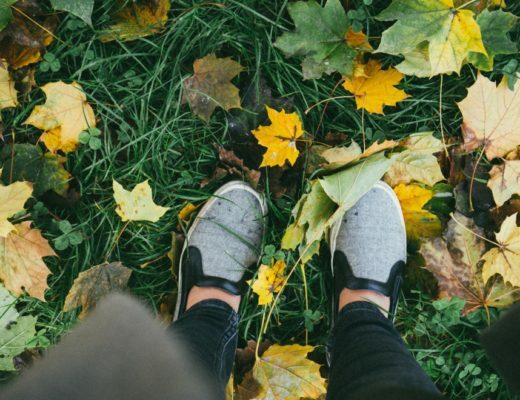 In our discussion, Tabitha also talks about how running her organization has become easier, and more focused, as she’s narrowed down the mission. She’s gotten closer to God, she’s become clear on what she wants, and who Luvmail serves, all of which has come with time, and experience. 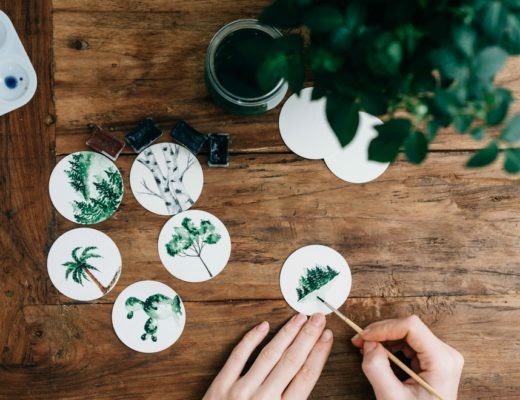 Her insights here are especially inspiring and re-assuring to anyone starting their own business or tackling a new mission. It can take time to feel comfortable, and time to grow into the role. 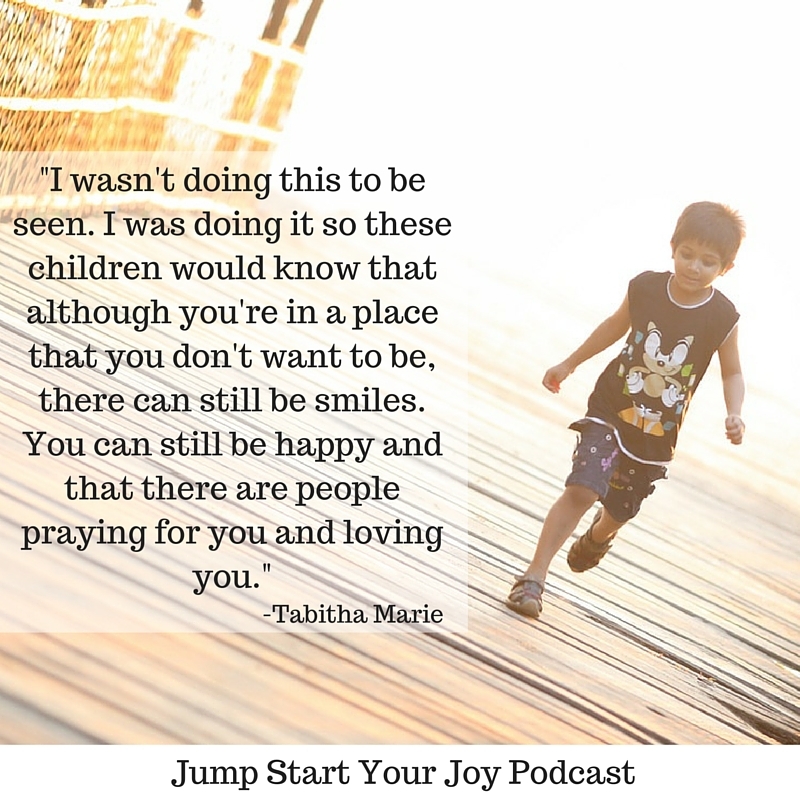 I’m so grateful to Tabitha for sharing her story and her insights on the podcast. Thank you, Tabitha! What an amazing human being! After reading this, I have decided to make this part of our collection at church. May she be eternally blessed! That is a lovely idea, Ida 🙂 I find myself wanting to do more after hearing Tabitha, too. Take care! I absolutely love this! I’m sure that those on the receiving end do feel blessed and uplifted by her generosity. Esther – I don’t know if you got a chance to watch the video, but seeing the little girl receive a goodie bag, and then seeing Tabitha’s reaction … well, it gave me goosebumps. It’s seriously one of the most heart warming things I’ve witnessed. You got Tabitha! I started Operation Christmas Cheer to help brighten hospital rooms for children and their families during the holidays. It is such a joy to be able to comfort them and bring them a little joy too! Thanks for all you do Tabitha! and thank you Paula for sharing Tabitha’s work! Of course! She’s an amazing person with a huge heart! What an amazing organization! When I was in high school I was in a car accident and spent a significant amount of time at Shriner’s Burns Hospital. My community rallied around me and I had a lot of letters and cards, it definitely helped the recovery time. What a beautiful idea! I have a special heart for any sick child. Our best friend’s daughter got a heart transplant almost a year ago to date and it was so impressive the amount of love and support she got from lovely strangers with huge hearts like Tabitha. We need more people like her in the world. Thanks Brittany – it is really hard to see any child in the hospital. I have really loved Tabitha’s big heart ever since I first came across her ministry. Oh, wow, that is such a fabulous, generous idea! I really love the idea of Luvmail and hope Tabitha Marie & Co. gain a lot of traction from their recent publicity! This is the first time I heard about Random Acts of Luvmail. How nice of Tabitha and her family to do this campaign. For sure, they make a lot of families happy. Love this what a truly wonderful organization. I had never heard of this before but it sounds fantastic, such a great campaign. What an incredible woman Tabitha is she is so selfless and we need more people like her. I would rather see her as a role model than Kim Kardashian that is for sure and I wish that my generation took notice o people like Tabitha and acknowledge how brave she is. Good for her! There’s a young girl here in Kansas City that’s formed a similar charity. I love it when people give back. It’s very good of you to spread the word about such fabulous organization. Thanks to people like Tabitha this world is a better place. What a beautiful idea. I love the idea of Luvmail and helping sick children feel better through her acts of kindness. Such a great cause, thank you for sharing Tabitha’s story. What a wonderfully kind woman. Even with all the horrible things happening in the world right now, it’s people like this ho give us hope! My friend and I were just discussing something similar to this to do for the Christmas holiday just as our way to show love. I must say that she is a true blessing and these kids will forever remember and be thankful for what she’s done. Thank you for sharing. This was a very inspirational post. When my Mom was in the hospital, the children’s cancer floor was adjacent, so I would come in contact with a lot of the younger patients. Anything to uplift their spirits is welcomed and really brightens their day. We definitely need more people like Tabitha. What a wonderful way to bless kids that are in the hospital!!! Thanks so much for letting us know how we can help out!